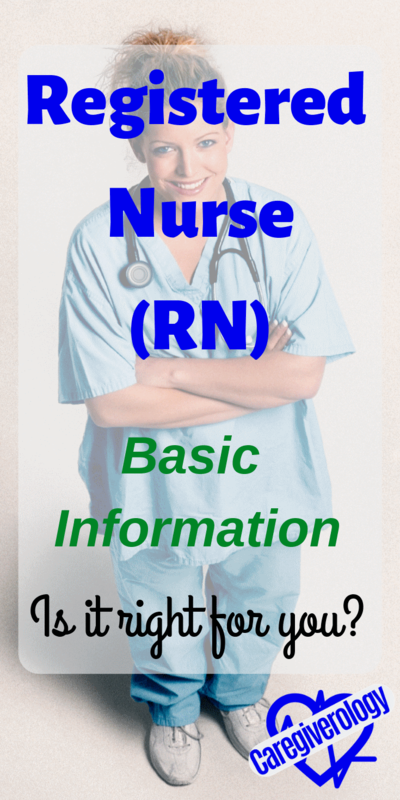 Since I am now a registered nurse (abbreviated as RN), I plan on adding a lot of nursing content on this site with this page being the hub. We consist of a large portion of the overall caregiver ecosystem. With that being said, anything you read here should be taken as advice and not facts. Whether you simply have an interest in becoming a nurse or you have been one for years, it is still important to ask yourself if it is right for you. This is a difficult and complex question that should be thought about thoroughly. Let's be honest, it isn't for everyone. It is one of the most challenging paths you can take in life. There is nothing wrong with admitting that it isn't for you. Many people are pressured into the medical field either by family or even friends. What might be right for them, or what they think may be right for you, doesn't mean it necessarily is right for you. If your gut is telling you to explore other options, there is nothing wrong with doing just that. You should always be the one in control of your own life. But what if you yourself don't even know what path you should take? There is plenty of content on this site as well as others that will help you make a decision. Research as much as you can before committing to a nursing program. And I don't mean just researching about the program, but primarily about the career itself after the program ends. If you really want to know first hand, you could volunteer at a hospital or similar facility or even become a certified nursing assistant (CNA). It's a lot less commitment to get started and it gets you working right alongside with other nurses. There have been countless others who have done this for this very reason. There is nothing wrong with getting your feet wet before diving in head first. I emphasize this because you don't want to be stuck in what many people consider a lifelong commitment. I've worked with coworkers who are just not happy with the career choice they've made and then there are others who couldn't be happier. We are all unique and we shouldn't try try compare ourselves to others. We should instead focus on what makes us special, even if that means turning away from something as amazing as nursing. This job is done and interpreted differently in various locations. I'm not just simply referring to changes throughout different cultures. In the United States, different states have varying policies. And to make things even more complex, different facilities and even different units within those facilities, have varying rules and regulations. I know this first hand by working on other units within the hospital where I am currently employed. Floating to other units has shown me just how differently things can be done within the same building. It can be a little off putting at first. One unit isn't necessarily doing things the wrong way compared to the other, sometimes there's just more than one way to do something correctly. Things also change with time as new trials are tested and research is done to do things better and more efficiently. This is often called evidence based practice. This was a term that was constantly brought up during nursing school. I know just from working in a hospital all of these years, that change is a constant factor at play in the medical field. I previously worked as a CNA and I now currently work as a nurse. (For the difference between the two, click here) You can never get too comfortable with the way things are done because change is imminent. Some people may view this negatively but it's for the advancement of medicine which is vital if we plan to thrive as a species. It's an effort to keep things moving forward, not just to save more and more lives, but to improve upon them as well. Nursing school was the most difficult challenge I ever faced which in turn made it my biggest accomplishment. Words can't describe the relief I felt when it was all said and done. Although, the journey was just beginning. I still had to pass this little exam known as the NCLEX. The challenges didn't go away after that, orientation and precepting with another nurse were some of the scariest weeks of my life, not to mention being on my own for the first time. Even the first few months were so anxiety inducing to the point of wondering if I deserved my license. I say all of this to let others know that these feelings are normal. All nurses in training, brand new nurses, and even seasoned ones face many challenges that can lead to fear of ever encountering another patient again. But we must press on and embrace challenge and learn from our mistakes. My Journey to become a nurse has been long, challenging, and stressful. I plan to share more about the personal experiences I've had leading up to this point as well as general information to help others who are already nurses or have an interest in the field. Writing about this subject will be an ongoing challenge. First of all, I don't have the most experience and even as I gain more experience, there are so many things to cover. Nursing is such a broad subject with multiple branches of work. Expect this page, as well as the ones linked to it, to evolve over time as I evolve more and more throughout my career. I hope you find something entertaining and, more importantly, useful regardless of how much you know or don't know about nursing. If you don't agree with something I've said, let me know. Click on the links below to explore other pages.